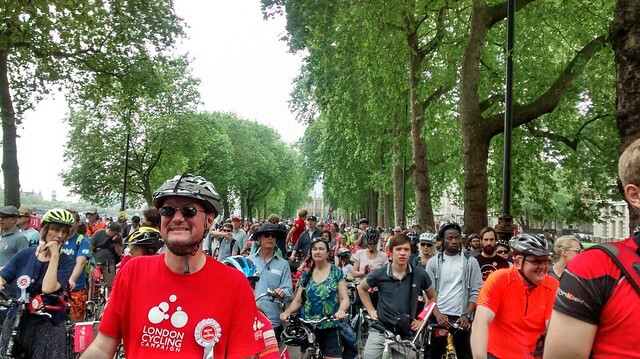 Well, a bright sunny day in London today and it marked the London Cycling Campaign’s Big Ride. 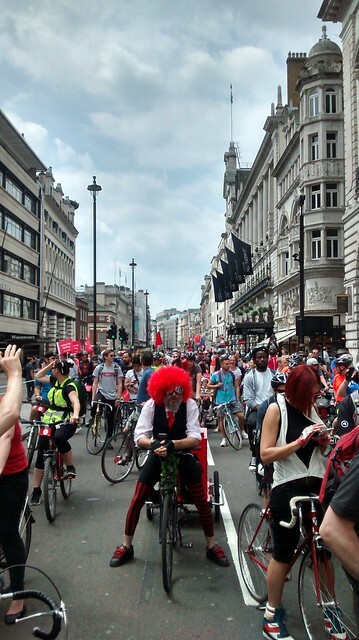 This ride is a, I guess, a protest ride drawing attention to the fact that London cyclists would like more room for cycling. Whilst I don’t agree with all that the LCC want (some of it is beyond what could sensibly be done, other than shutting traffic out of London completely), but I still think it’s important to support them (CTC of which I am a member is also supporting the Space for Cycling campaign as well, as it’s now a nationwide movement) as I would love to see some well thought out changes to cycling in London. I made it to speakers corner in Hyde Park for about 11. I thought that was the start, so I was slightly disappointed when I arrived and saw how few people were there. Turns out I was about an hour early. 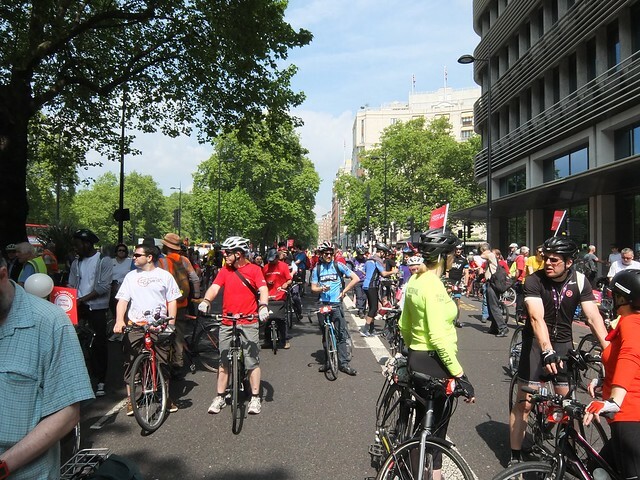 We moved over into Park Lane and the masses started to accumulate. 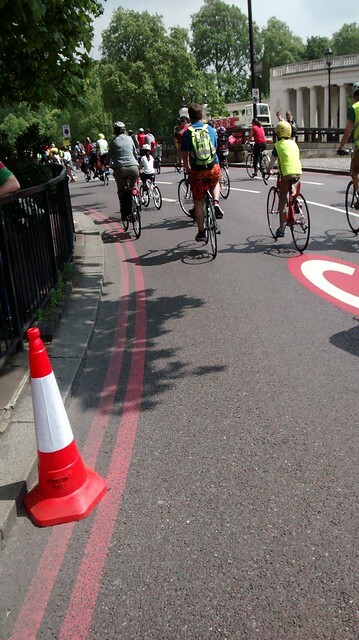 Was great to see so many families out on the ride as well - after all, children should be able to cycle safely as well! The ride had a party atmosphere thanks to this guy. There did seem to be a wide path behind him… I had to squeeze past at one point, just to save my eardrums! 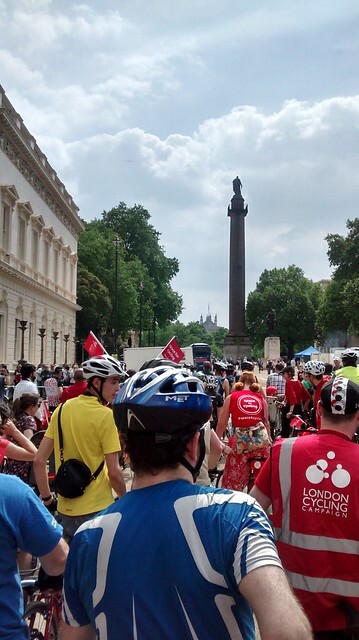 The Crimean War memorial provided a backdrop as we paused before heading towards Trafalgar Square. 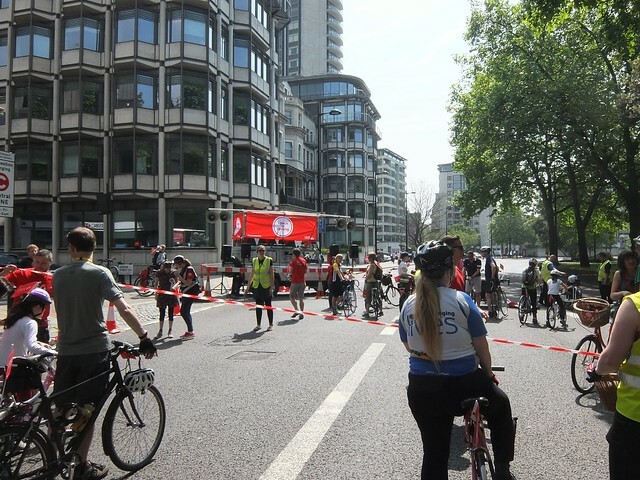 And finally, waiting for the last riders to catch up on the Embankment. As we got to the end, I peeled off and headed back to Kings Cross to get home. Overall, was a pretty interesting ride - noisy but good fun. Now to rest up before taking part in the main entertainment for the weekend, the Brompton Urban Challenge!